The XML Schema Generation and Import is a built-in facility to model, forward engineer and reverse engineer XML Schemas. XML Schema Definition (XSD), also known as XML Schema, is a World Wide Web Consortium (W3C) XML technology and is used in a wide range of industries to encourage standards compliance and messaging using a common schema. The XSD specifies the rules to which an XML document must adhere and can be automatically validated by a number of tools. The XML Schema Generation and Import facility can be used to visualize or create a model of an XML Schema (XSD). This is particularly useful when the repository is describing shared messages or a schema that is based on a standard. 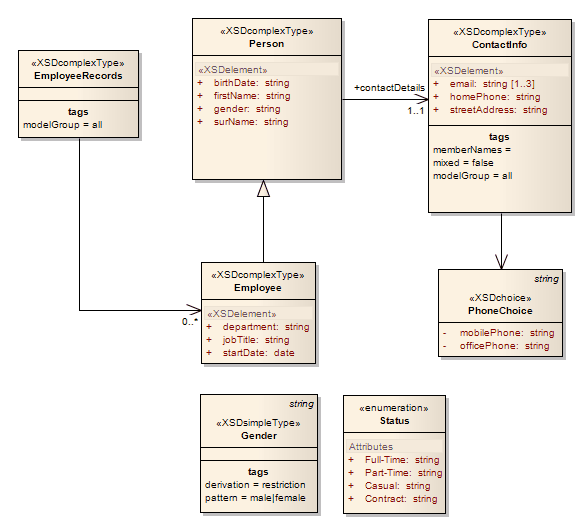 An XML Schema can be created using an in-built model transformation applied to an abstract Class diagram or it can be modeled using the XML Schema Toolbox page using a Class diagram. 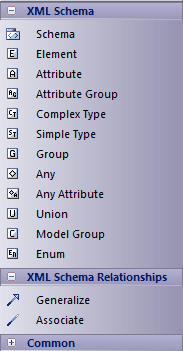 Either way the completed schema model can be generated to create an XSD file using names and details specified in the Tagged Values of the Schema Package. There is also a purpose built tool for working with schemas called the Schema Composer, which allows messages to be created based on part of a schema.